Fantastic Four is an animated series produced by Hanna-Barbera Productions and the first animated series based on Marvel's comic book series Fantastic Four. The program, featuring character designs by Alex Toth, aired on ABC from 1967 to 1970. It lasted for 20 episodes, with repeat episodes airing on ABC until the network cancelled the program. It was also rerun as part of the continuing series Hanna-Barbera's World of Super Adventure. Through a series of transactions, Disney currently holds the rights to the majority of Marvel's 1960s-1990s animated output (including the DePatie-Freleng Enterprises and Marvel Productions library). 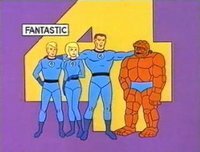 However, the 1967-1968 Fantastic Four was produced by Hanna-Barbera, whose library is owned by Time Warner, making the series one of only a handful of Marvel-related TV projects not owned by Disney (which has since acquired Marvel outright). Time Warner is also the owner of Marvel's biggest competitor, DC Comics. This webpage uses material from the Wikipedia article "Fantastic_Four_%281967_TV_series%29" and is licensed under the GNU Free Documentation License. Reality TV World is not responsible for any errors or omissions the Wikipedia article may contain.